Current customers of pioneering bank – first direct – rate the brand’s understanding of them more highly than customers of nineteen other leading brands, including Amazon and Apple, according to the pilot study for the Mutual Understanding Measure™ conducted by research company Habit5. Whilst The Open University was rated as the best understood brand, on the same study. 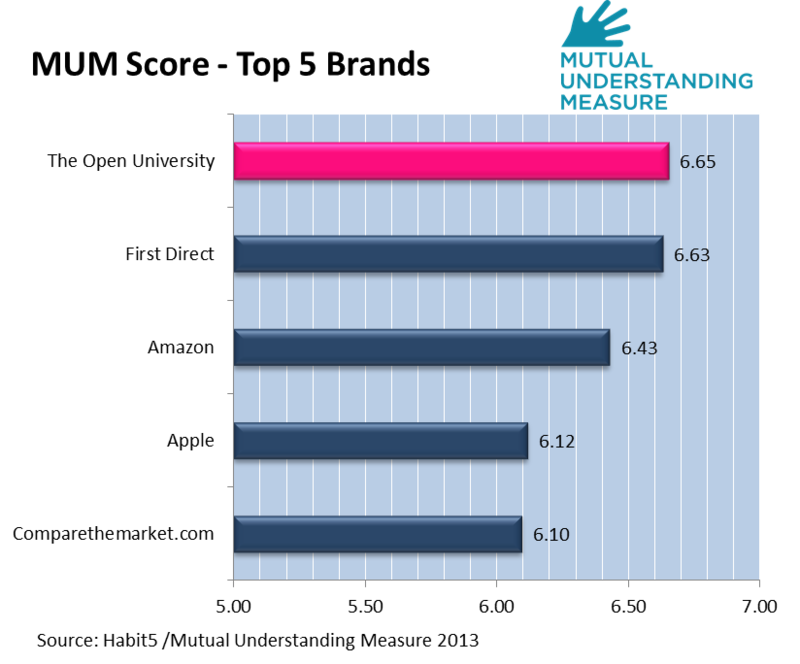 The Mutual Understanding Measure™ claims to be the first comparative and comprehensive survey of both customer understanding and brand understanding in the UK. 1,128 UK Adults were asked to rate how well up to three brands, that they are current customers of, understood them, across six different dimensions. This was followed by a further three questions investigating how well they, in turn, understood each brand. first direct, long renowned for great service, achieved the highest customer ratings for its understanding of: current needs, future needs, preferences and overall understanding, alongside having the most satisfied customers on the survey, who also claim to have the best comparative understanding of the brand relative to its competitors. The Open University was rated by its customers as having done the best job at explaining why it is in business. Its’ long established commitments to ‘education for all’ and ‘lifelong learning’ will have all contributed to this strong showing. The Open University just pipped first direct to top spot on overall customer understanding and brand understanding combined, the inaugural ‘MUM’ score. The pilot study also found that two thirds of UK Adults believe that it is ‘extremely important’ that brands have an ‘excellent’ understanding of their customers, with less than 1% of respondents seeing this as unimportant. Males and people in the Midlands are most likely to stress the importance of being extremely well understood as a customer. This desire exerts a very strong influence at both ends of the age spectrum. Over ten times as many people believe that it is ‘extremely important’ these days that customers have a clear understanding of the companies that they buy goods and services from, as see this as an unimportant consideration. Track understanding as a sustained driver of loyalty and revenues.